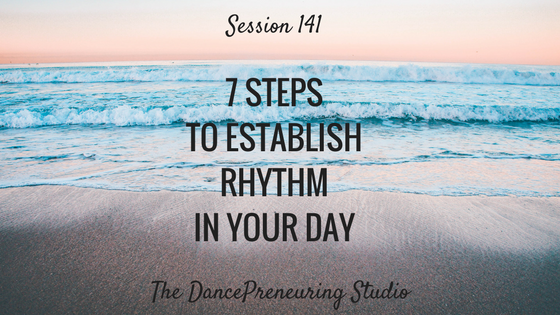 In this session of The DancePreneuring Studio, I talk about recognizing the rhythm that is all around you and applying that rhythm in dance, life and business. Step to Success: A step to your success is anything that moves your life and your business forward. Whether it’s an app, a book or an idea, you can apply something today that can help you succeed. Today’s step to success is getting clarity on how you define things and understanding definitions from others. Dancer’s Dialect: The Dancer’s Dialect is the dancer’s language. I share dance terminology and concepts across different genres so you can see the correlations in your life and in your business. Today’s concept involves rating yourself from 1-10 on one aspect of how you did in a dance class. 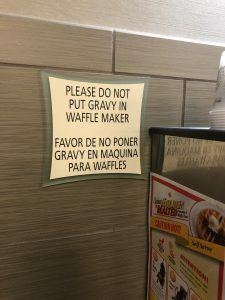 Freestyle Flow: So how many people did it before they had to put this sign up? 1. Determine the current rhythm or what you would like it to be. 3. Find two or three highlights that would make your day have harmony. 4. Have your ideal visuals all around you. 5. If something is out of sync, shorten the time you dwell on it. Work on letting it pass. 6. Recognize when the rhythm needs to change and adjust accordingly. 7. Regardless of how you “perform” 1-6 above, you are still valuable and that is the most important thing to keep in mind as you are establishing rhythm throughout your day.